One of the things I love most about beauty is how certain products are tailored for certain times of the day, month, year and season. It’s basically just an excuse for us beauty junkies to accumulate more goodies to add to our obviously ‘essential’ collections. So with this in mind I thought I'd share with you some products I'm currently enjoying using in the evening. I have always been a bath girl at heart, I enjoy the convenience and freshness of a shower, but for me, nothing could replace the comforting feeling of a bath. Recently I've been enjoying my night time soak with the Avon Sleeptherapy Dreamy Body Wash, this bubbles up a treat and is actually a really soft luxurious wash too. But the deal breaker with this is the scent, oh my goodness, this smells delicious! It’s so gentle and relaxing, the perfect way to end a long day, and it’s also very reasonably priced too. If I’m really feeling like pampering myself then nothing feels more spa like than the Arran Aromatics Lavender & Black Pepper Mineral Soak, a handful of these salts thrown in some running hot water will transform your humble bath into what can only be described as a haven! 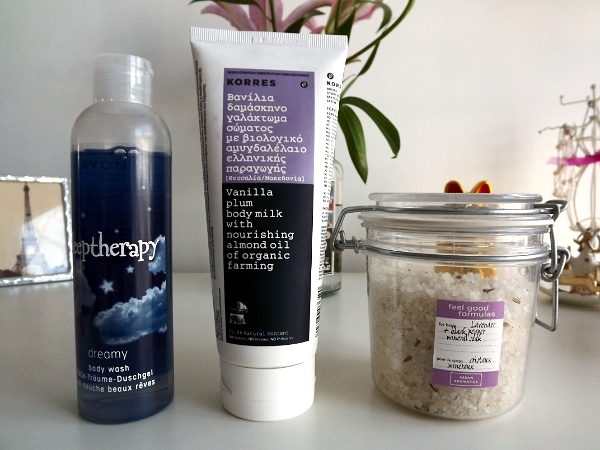 To top of my bath time ritual I always find myself going back to the Korres Vanilla Plum Body Milk, this stuff works wonders on my skin and is also very light and fuss free, which is perfect for when I really don't want to spend too much time pampering. The scent is a very deep, warm musk that won’t be to everyone’s taste, so definitely give this a sniff before you purchase! 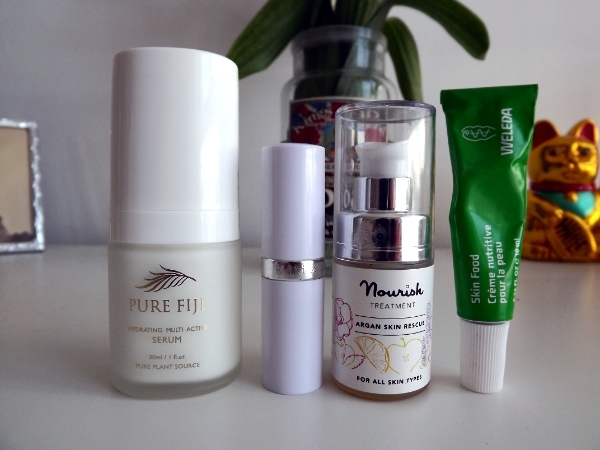 Currently, the favourite part of my night time routine is using the Pure Fiji Hydrating Multiactive Serum*. I’ve never tried a serum like this, the formula is so light and cooling and the scent is wonderful, very exotic. I pat a pump full of this into my skin before my moisturiser morning and night and it’s really transformed the surface of my skin, this is definitely going to be part of my skin care routine for a long time. I always find the easiest way to keep on top of the condition of your lips is to smother them in a good quality balm before bed, my treatment of choice is the Elizabeth Arden 8 Hour Cream Lip Balm, super handy, very conditioning and a firm favourite. If my skin is feeling a little dry or just in need of some extra TLC then ill add a pump of the Nourish Argan Skin Rescue Oil* into my routine, this smells delicious and works well with my oily skin to really hydrate my skin without adding to the greasiness. Something that goes hand in hand with my nightly dose of lip balm is the Weleda Skin Food*, I love to pop this super concentrated cream onto any dry patches or cuts and bruises to really give a deep moisture surge whilst I sleep, this is another product that’s really handy to just keep by your bed or in your handbag! 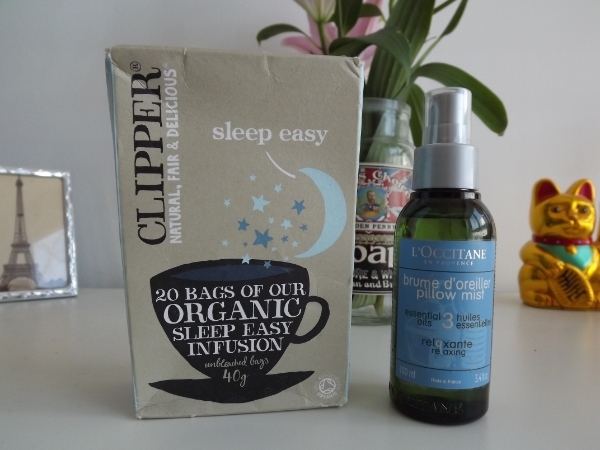 It wouldn't be bed time without a cup of tea for me, and my current favourite night time tipple is the Clipper Sleep Easy Infusion, packed with ingredients such as Valerian, cinnamon and chamomile this stuff is delicious! Last but by no means least is my new favourite sleeping companion, the L'Occitane Pillow Mist, my boyfriend picked me this up last month, and since then I've been using it constantly, I think my favourite thing about it is that it doesn't smell like lavender, as much as I love lavender bathing products, I'm not too fond of them on my pillow, to me this scent is indescribable, you need to go have a whiff!